Civic Center Residents Coalition NYC: Chinese business owners left "post-storm aid meeting" with disappointment. Chinese business owners left "post-storm aid meeting" with disappointment. The government-held post-storm aid meeting was a great disappointment ; Chinese business owners cried they "need subsidies not loans"
Chinese Consolidated Benevolent Assoc. Mott st. Many politicians and representatives at all levels from government gathered in the auditorium of the Chinese Consolidated Benevolent Association yesterday (9th Nov), introduced various post-storm aid programs. The event attracted about 200 people from the business community to attend, however the aid is just low-interest loans rather than subsidies therefore many people felt disappointed. More importantly, the business owners pointed out the Chinatown economy has been barely breathing for 10 years, future is not guaranteed even they made through this time. Politicians and community agencies which taking government money need to produce a long-term rehabilitation plan. Although the business owners have different backgrounds, but all have the same anger. The owner lady of Bayard Street Old Sichuan Mrs. Chu already became very impatient when listening to the loans introduction, at last she was the first who shot. She pointed to the speakers on stage and yelled, "You talk a lot. But we don’t want loans. We need direct subsidies. Just like that after 911, each of our employees received 500 dollars. We all are realistic." Her argument won approvals from many business owners in the audience. In those, Chan Kin Yung said, "One needs to pay back the loans. Everybody wants direct subsidies. Another added, banking system in Chinatown reserves 60 hundred million cash for many years and the fund is sufficient. Government procedures for loan application are complicated. Who would take that difficulties rather than the easy approach? However, members of Congress Velazquez pushed the problem to the Republican Party, said that she had made a funding proposal in Congress but Republicans blocked it. She also said the new session will start next week, and she will once again raised the subsidy plan. Business owners are expected to be patient. 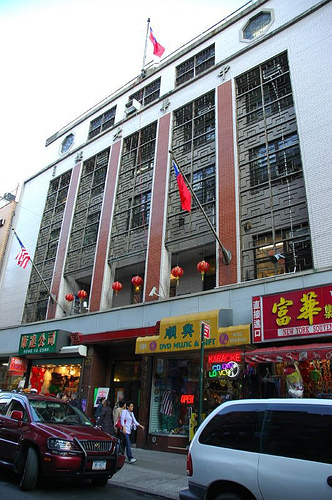 It is followed by the owner of Hong Kong Station Lai Chi Fung. He pointed out that losses made by the storm cannot be recovered, and Chinatown economy is stagnant as a pool of still water. What is the direction to go in future? Business owners still have to continue to pay rents, utilities and labor. 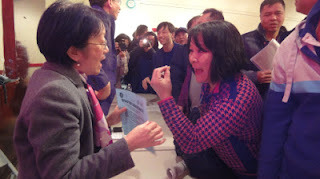 “What plans do the politicians, associations, community agencies and BID (Business Improvement District) have?” Although the City councilor Margaret Chin tried to take the question, she was unable to provide any actual answer because there are structural deadlocks in the Chinatown economy and it is not her expertise. Then business owners in the audience were getting more fierce. The owner of Mott Street Mottzar Kitchen couldn’t help shouted, "Otherwise no one will come to your meeting next time", meaning they all we have to close down. Margaret Chin reminded the owners can come to her office if they need helps on the loan applications. To that, the owner of Man Yau Stationery Lee Kwok Wai expressed with his dissatisfaction, "If it is about to fill in the forms, we can do it on our own on Internet." Or it is even easier to have these information printed on the media. Because the losses including goods and profits are difficult to estimate, everyone wants to know the way to go on. He also hoped that, by this chance, the business owners are able to help each other and think about the future together. The owner of Mottzar Kitchen Wong Suet Yu said, "if there is no plan, they have to close the business and then lots of people will become unemployed." 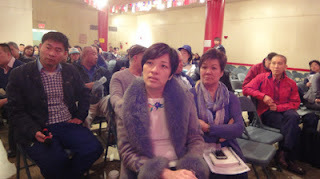 In fact, the storm matter indeed evoke people’s introspection about Chinatown economy. Issues such as transportation policies failed to attract tourists and housing policies crowding the middle class second-generation Chinese immigrants have cut these two upscale consumer groups. While other Chinese communities have been set up, the demands are diluted. However to solve these structural problems involves the interests of several large bodies in Chinatown. Just as what a community member Cheung Ying Ying said, “People holding vested interests don’t easily let go." Many representatives from different community presented yesterday, including Director of the Business Improvement District Wellington Chen Jok Chow whose achievements only limited to street cleaning, Director of the Asian Americans for Equality Christopher Kui Yuen Yee who became a large landowner in Chinatown benefited from parity house policy, Chairman of the Chinese Chamber of Commerce Yue Kum Shan who claims himself representing the interests of the commercial sector but did nothing for years. The business owners’ views are worth to them to think about.